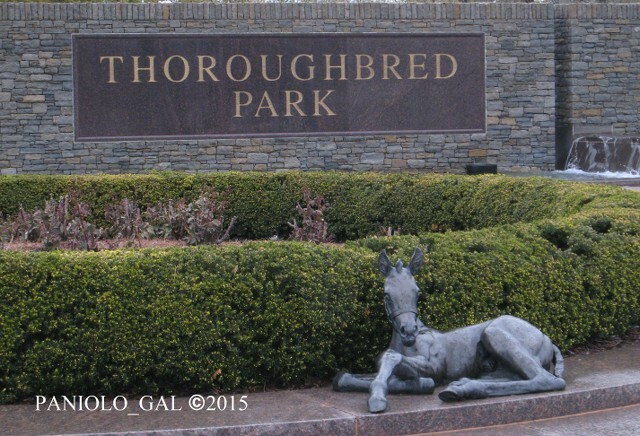 Visiting Thoroughbred Breeding Farms-A Personal Adventure! 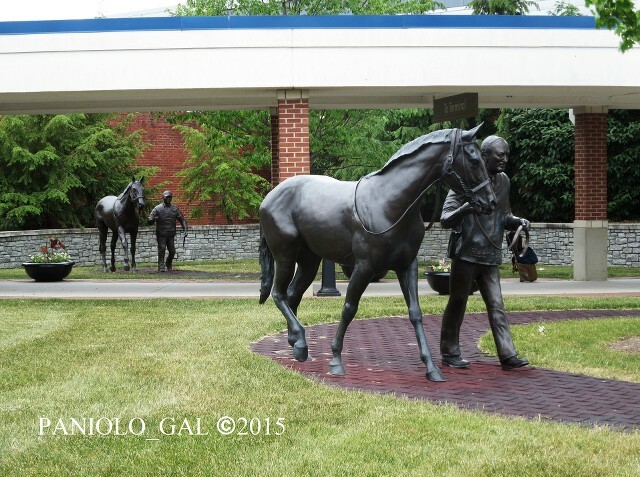 This thread was created to share my photos taken in late May 2015 during my recent adventure in Lexington, Kentucky. But after my review, this thread will be left open for others to also share their personal photo stories of visits to these "Equine Facilities" in the USA and elsewhere in the World. Note: Photos are to be your very own and not obtained from other websites or social media that are not yours. Please be sure to watermark your photos or list yourself in the photo credits! If you do not know how to post images in the forum, please check with those that have the ability...we will be more than willing to help you share your story! 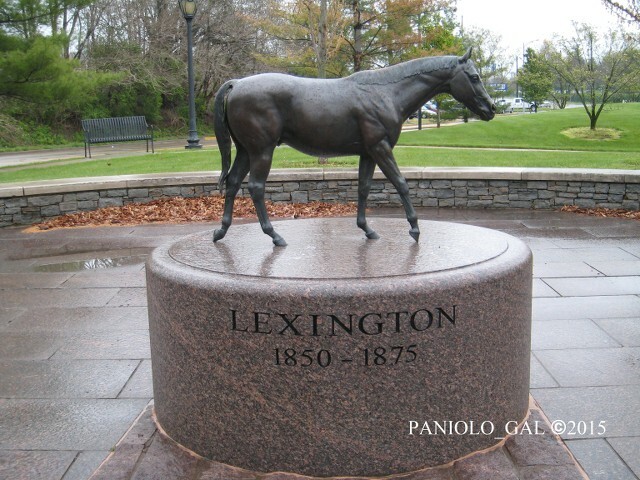 Before I start my adventure in the "Horse Capital of the World", I would like to thank lauraj_cincinnati in her help, advise and expertise of the Lexington area. Her deep knowledge of the area enabled me to plan a truly worthwhile itinerary a few weeks before I went on my trip. Note: There were other equine venues visited while in Lexington, but I will separate them out into more specific "topic" discussions such as behind the scenes at racetracks & training facilities, photos taken at the Kentucky Horse Park and other Equine Parks, as well as Old Friends/other aftercare TB facilities. This way, later postings by others will be in more cohesive discussions. 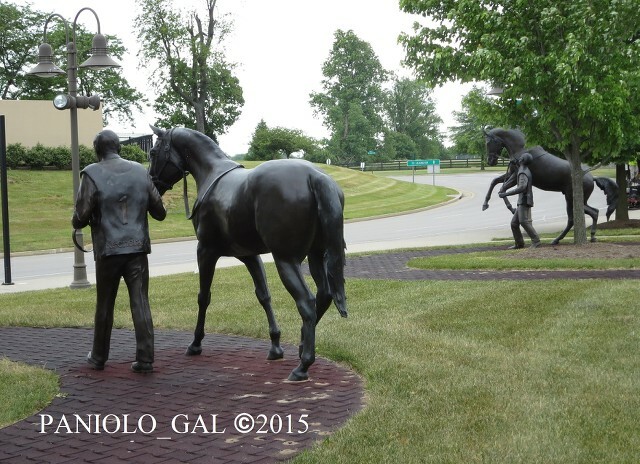 LEXINGTON, KENTUCKY: ENTERING THE WORLD OF THE HORSE! 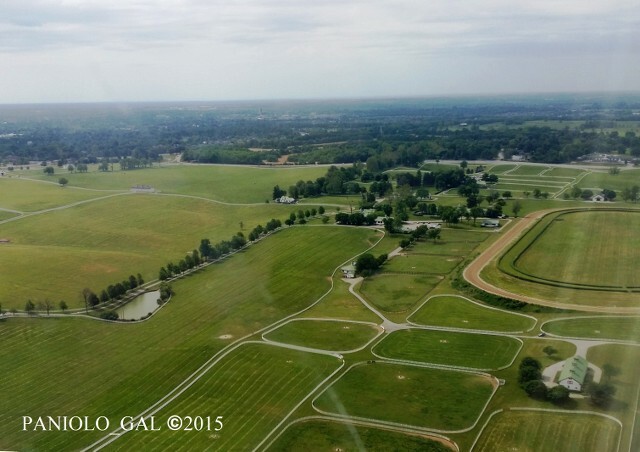 ▲The sprawling white picket fences and green roofs of Calumet Farm taken from the airplane just before landing at Lexington's Blue Grass Airport. The estimated economic impact of Kentucky's horse economy is $4 billion annually. Only in the Horse Capital of the World would you expect to find such astonishing figures! But I was surprised to find that the horse industry is Kentucky's number two agricultural cash crop based on cash receipts from farm commodities. Lexington and Fayette County ranks first in number of acres dedicated to the Equine industry. 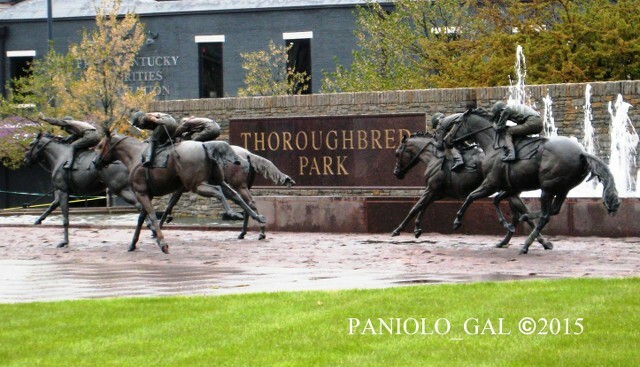 ♦Lexington is home to the official registry of all Thoroughbred horses world-wide, The American Stud Book kept by The Jockey Club. ♦The Kentucky horse industry is responsible for nearly 80,000 direct and indirect jobs, from grooms to administrative support staff to veterinarians. ♦This region is committed to taking care of retired race horses. 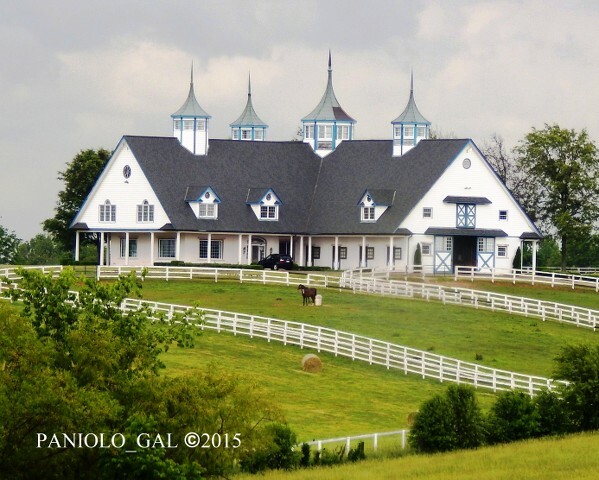 There are 13 Equestrian Retirement Facilities in Kentucky. 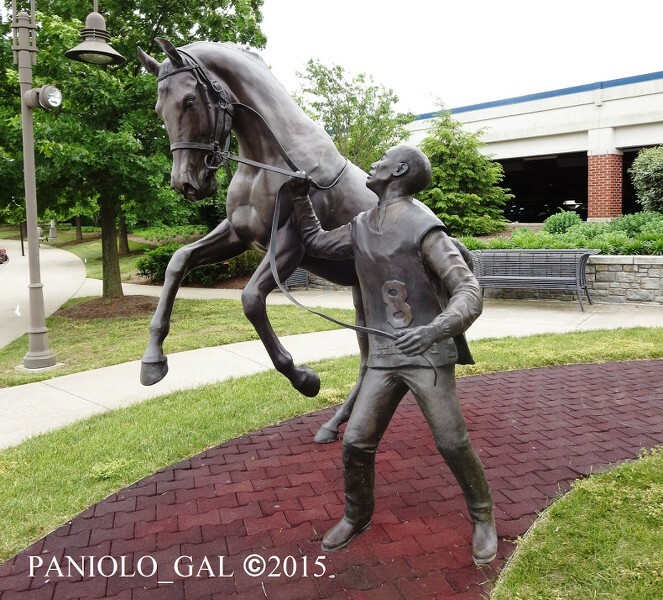 ▲You can tell the importance of the Thoroughbred to this region when we arrived at the Blue Grass Airport and headed to the car rental building only to discover these wonderful statues created by world-famous sculptor Gwen Reardon! 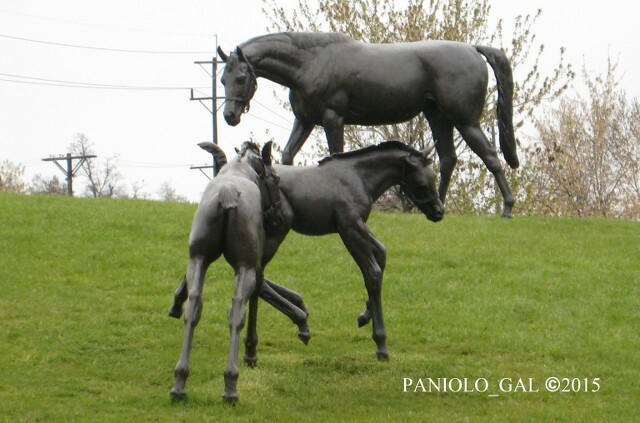 The Triangle Foundation unveiled Bronze Horse Sculptures at the Blue Grass Airport on 10/21/2008. 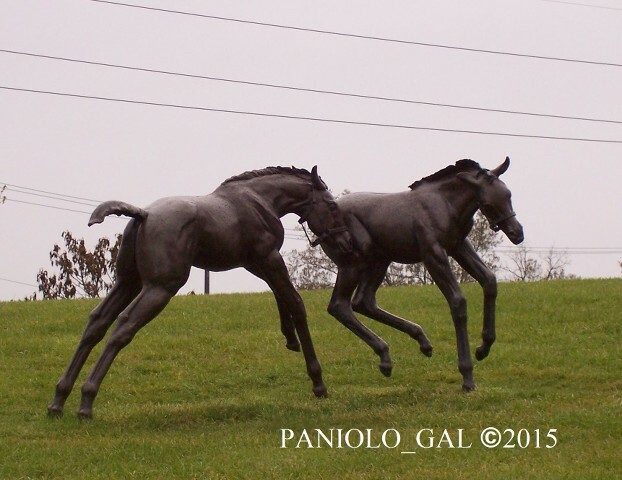 These beautiful life-like statues were created by Gwen Reardon and is located in a "paddock" between the airport terminal and the rental car facility. The "paddock" represents Keeneland's Paddock as racers are brought to be saddled. 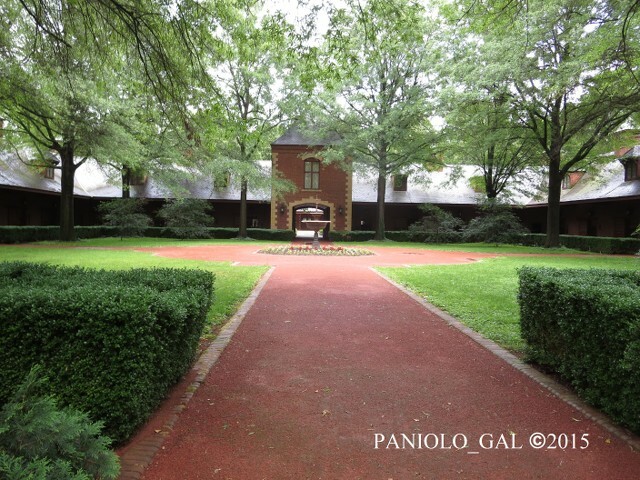 Keeneland Racetrack donated these synthetic pavers and landscaping elements that surround each of Gwen Reardon's works of art. ▲The excited posturing of this young racer was captured like a moment in time! ▲I could not recognize who this distinguished looking person was escorting his mount to the paddocks. Does anyone know? ▲Another view as we turned around to proceed to the car rental complex. ▲A glimpse of another of Reardon's sculpture tucked away near the planter. I'm on the bus...can't wait for the tour. I'm looking forward to reading of your tour as well. But, first I have to quickly sneak in here with a quick note about an exciting and serendipitous discovery I made just yesterday--Wednesday. I had to deposit a foreign bank check from my sister into my actual credit union, not into an atm. I thought I would try doing it in the Hemet branch, which is in the town south of Beaumont, instead of in the Moreno Valley branch, which is west of Beaumont and has heavy, miserable traffic. I hadn't been to Hemet in over a year, so as I drove down the road toward the far end of town where the credit union was, I was greatly surprised to notice a new facility along the road. It's a 51-acre horse farm--BG Thoroughbred Horse Farm. So exciting. I'ts only 18 and a half miles from my home and they have lots of horses, 4 standing stallions, and a bunch of mares and foals to see out in the pastures. They also provide training for beginning racehorses and rehabilitation for injured race horses. They say they are "conveniently located centrally for all Southern California racetracks." They are also open to the public and do tours. I"m looking forward to driving down there some cool early morning and will take pictures. The farm was just established there in 2014. So exciting for me. Okay. That's all for now. Just had to share about finding the place before you got into the nitty gritty of your tour. Haha. Reminds me of Coz' first start! Looking forward to more!!! Lexington, KY is one of my favorite places one earth and a trip to Kentucky Horse Park is almost like Disneyland for me. One of these days I hope to go to Keeneland for one of their race meetings, and touring some of the farms is in with those dreams, too. 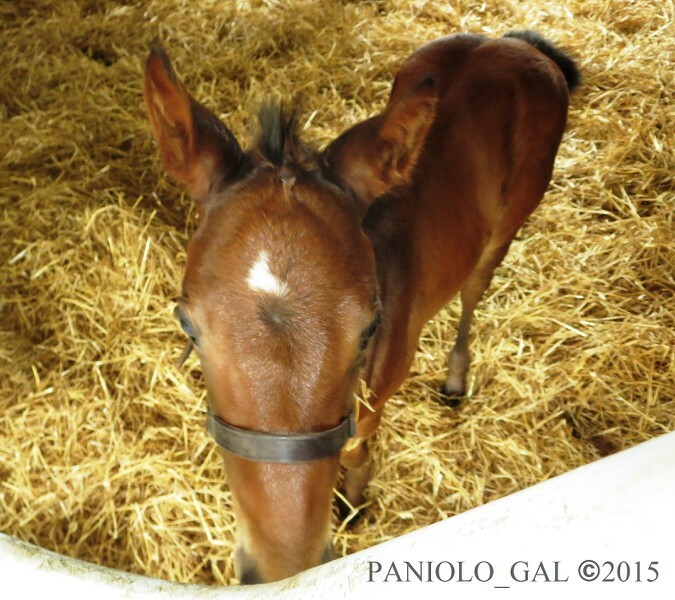 PANIOLO_GAL, Looking forward to your "tour"!! No detail is too small to share. Lexington & the farms are at the top of my bucket list. Thank you, @Paniolo_Gal for sharing this with us! I'll be hanging on to your every post! Indeed! Those statues are so cool! ▲The capturing of speed as the horses frantically race down to the finish line! In the heart of Lexington at the intersection of East Main Street and Midland Avenue is a beautiful park. 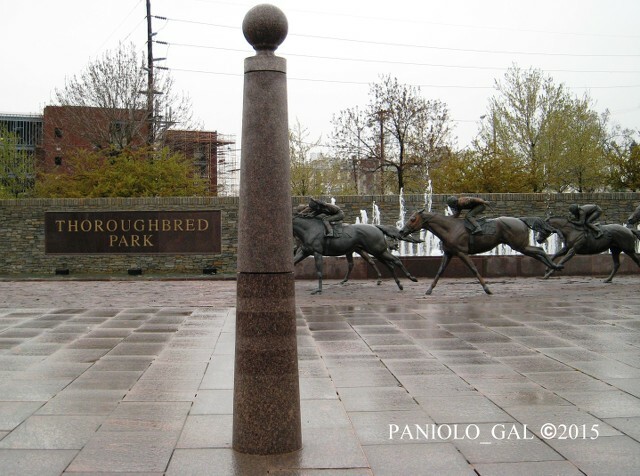 The Thoroughbred Park opened to the public on 7/2/1982. 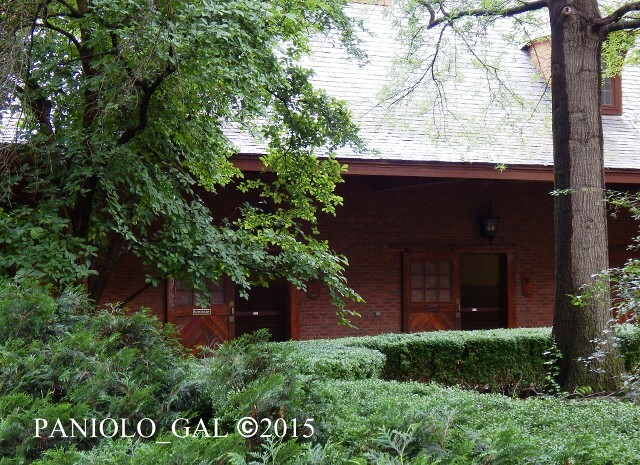 This tranquil 2.5 acre park reflects the dominance of horses in this region. There are 44 plaques honoring the men and women who spent their lives breeding, training, racing and owning these magnificent racers. 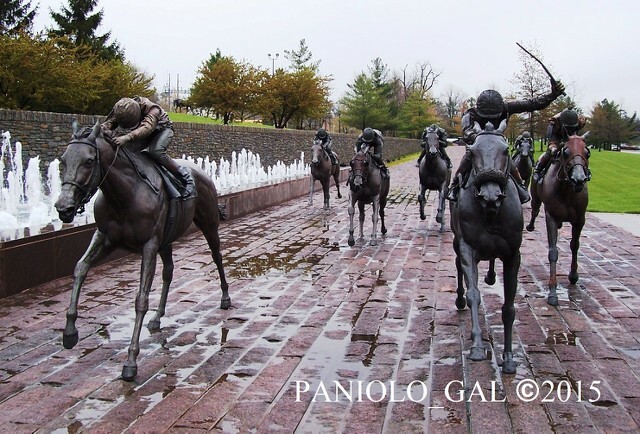 ▲A frontal view of 7 race horses galloping down the stretch trying to get to the finish line first. Gwen Reardon sculpted 12 beautifully detailed bronze statues, including the 19th century's greatest foundation sire in the U.S.-Lexington. Up on the hills of this park are broodmares and foaling frolicking. 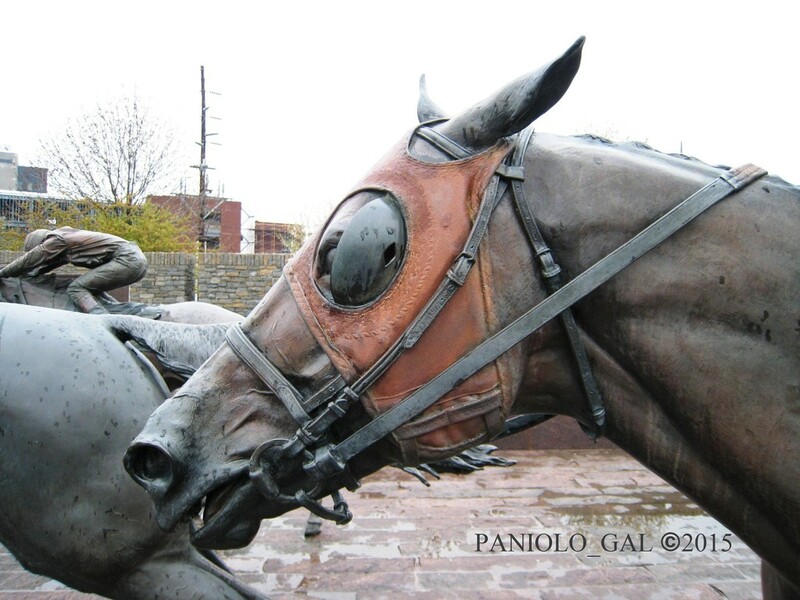 On street level, are 7 horses racing with planters of flowers that bloom which are symbolic of the Triple Crown Races: The Kentucky Derby, the Preakness and the Belmont. ▲A racer hoping to come in the "money" running in a close third. ▲A close-up view of the attention to detail that Gwen Reardon puts into her work. You can almost hear the horse breathing with nostrils flared...Amazing! 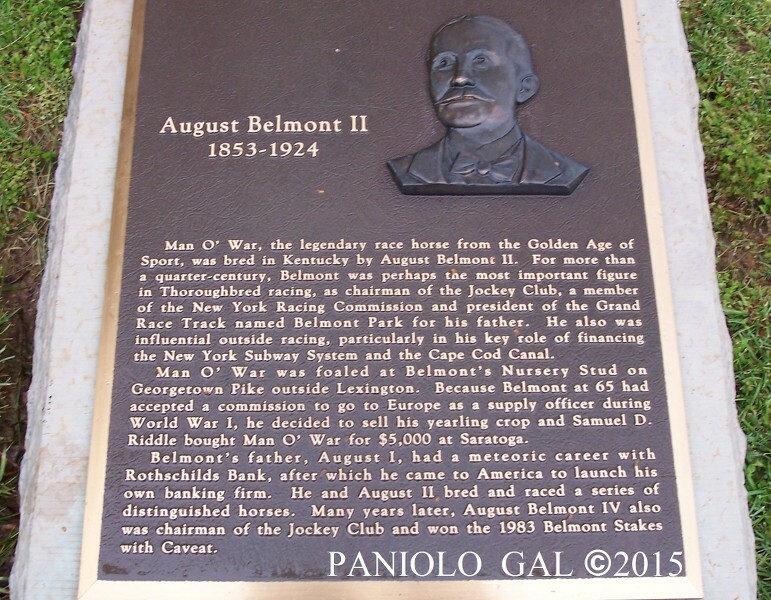 ▲At The Knoll: One of the 44 plaques running along the park's perimeter honoring August Belmont II who bred Man O'War! ▲At the Lexington Grove: Lexington, one of the earliest works of Gwen Reardon scaled down to quarter-life size cast in bronze. 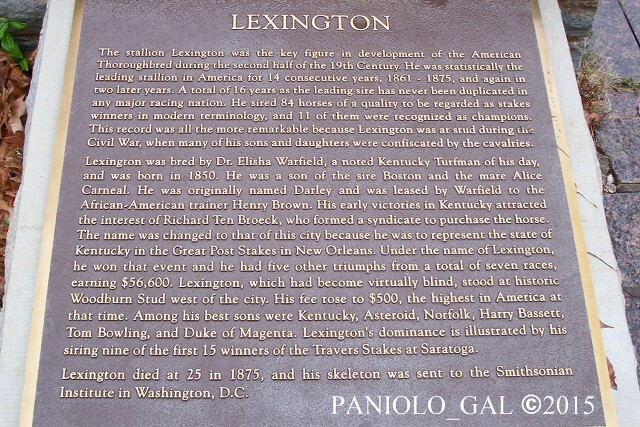 ▲One of the plaques commemorating Lexington. 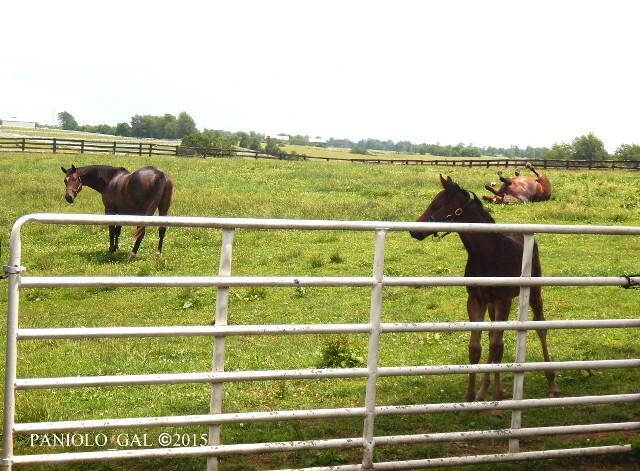 ▲At The Meadow: Mares grazing in the Meadow as their foals frolic nearby. ▲A mare keeps an eye on her rambunctious foal nearby. ▲A moment caught in sheer joy of life by this playful duo! ▲At The Track: Crossing the Finish Line...who won? Was it Pat Day or Willie Shoemaker? ▲I "think" it was Willie Shoemaker by a nose! He's raising his crop up in Victory! I believe Pat Day placed second. ▲A close up of the neck and neck finish. You can see the spell binding power and movement in these scuptures! 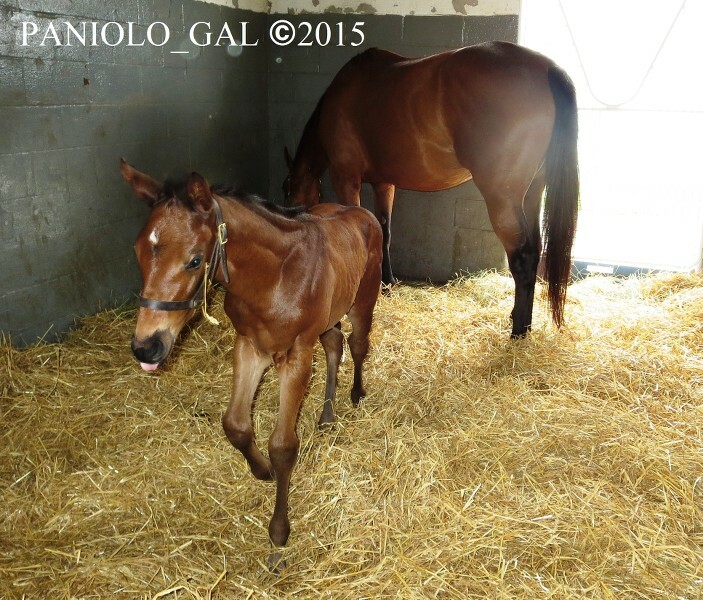 ▲At The Winner's Circle: In the foreground is the future of racing...a young foal entitled "The Promise". You can see the front running horse dashing to the finish line in the distance. ▲A closer view of "The Promise". The planter in the back would have been filled with blooming flowers of each of the Triple Crown Races. 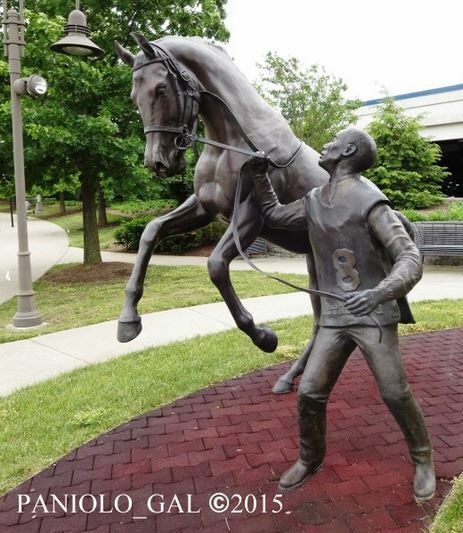 I believe a replica of this sculpture "The Promise" is also at the entrance to the Kentucky Horse Park as well. Gwen Reardon's love of horses began as a small child who would accompany her father who was a horse trainer & equitation instructor, patiently waiting for the promise of a ride at the end if she stayed put. Her determination to ride enabled her to became a state equitation champion at age 5! Her success in riding eventually led to her being the youngest competitor to win the ladies championship at New York's Madison Square Garden. In between waiting her turn up during these competitions, she started drawing on her show programs and developed her skills. Her program drawings became a sought after work of art and led to the demand for her paintings. A technique used by Charles Russell, she began to make small wax sculptures to aid in her composition of her paintings. Wax developed into clay and her clients wanted these sculptures as well. She enrolled in classes taught by the University of Kentucky Art Professor, John Tuska. She selected Lexington as a her first equine model. She would visit the Smithsonian where his skeleton was then on display and spent hours upon hours, measuring every aspect of his confirmation. She then sculpted him into clay with painstaking detail and then cast this statue in bronze. 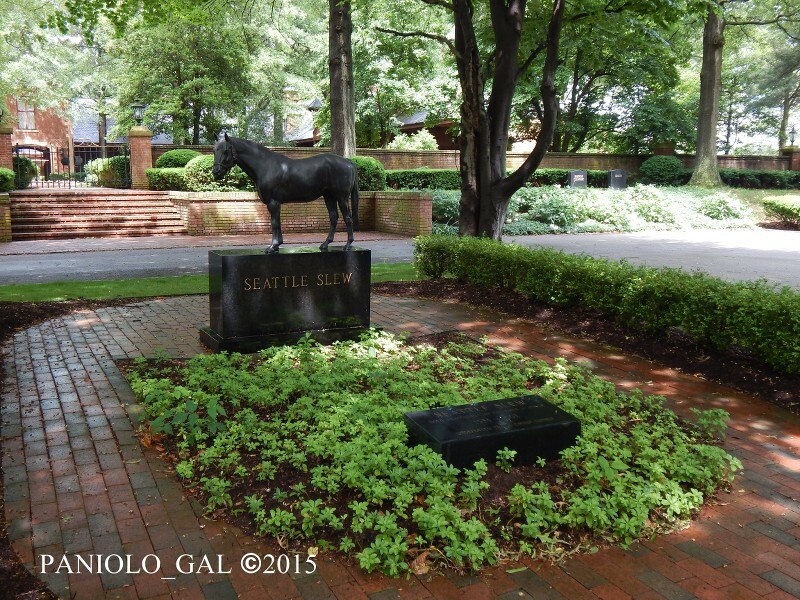 NEXT UP...TOURING AROUND THE AREA & A VISIT TO SEATTLE SLEW'S GRAVESITE AT HILL 'N DALE FARM! 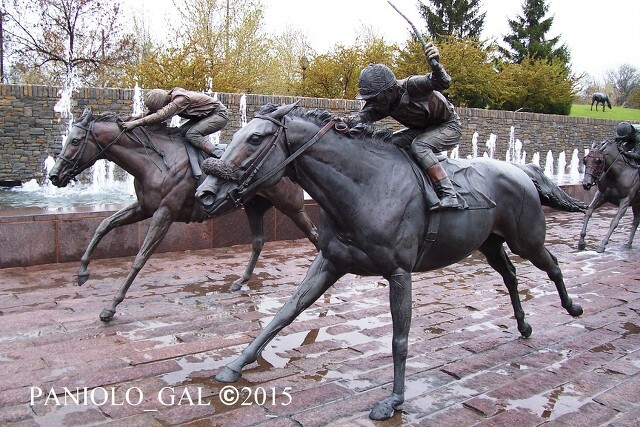 Yes...Gwen Reardon's bronze statues are awesome and sooo real looking! It's almost like they will come to life if you touch them! But what I am currently dealing with is trying to decipher what horse my husband took a photo of as he "forgot" to take a photo of the nameplate on the halter or on the stall wall. sigh! Around midday, a shuttle van from Thoroughbred Heritage Tour picked us up at our hotel. We decided it was best to relax and let someone else drive. We also wanted to get acquainted with the area and learn points of interest from our tour guide. Our initial stop was at Keeneland Racetrack but I will provide photos of this stop on a separate, new discussion topic: My Insider's Tour of Race Tracks & Training Facilities...to be posted later. Please bear with me as many of these photos were taken while we were touring along back roads and I have no idea what farm or area we were driving past during this tour. If I miss labeled any photos, please don't hesitate to provide your feedback. Next to Keeneland Race Track, was Manchester Farm which is a commercial Thoroughbred broodmare farm. 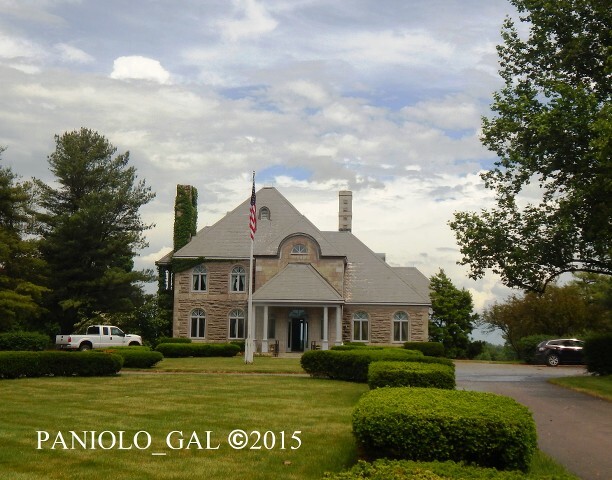 It is one of the most recognized farms in Kentucky and this historic property is owned by Houston Oilman, Mike G. Rutherford who purchased the Farm in 1976 from Duval Headley (his family founded Keeneland Race Track). 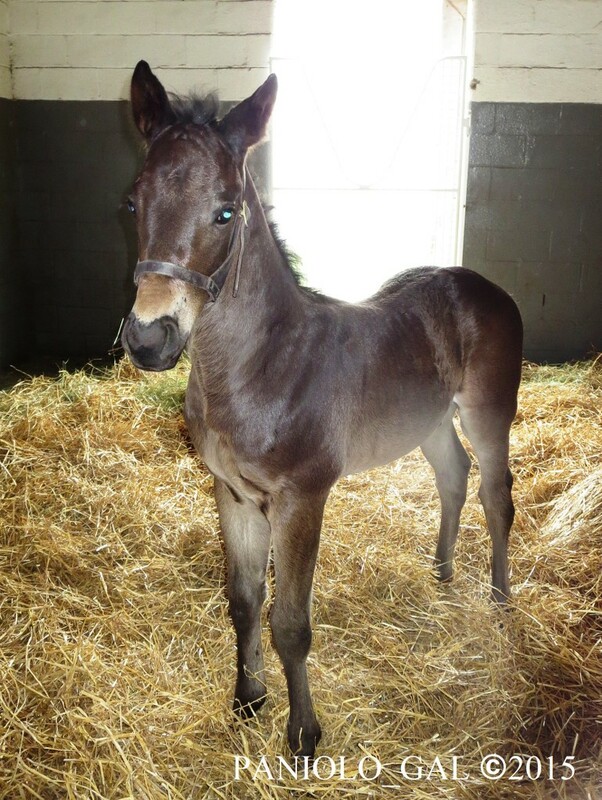 Manchester Farm foals between 15-20 babies a year and sells a majority as yearlings. 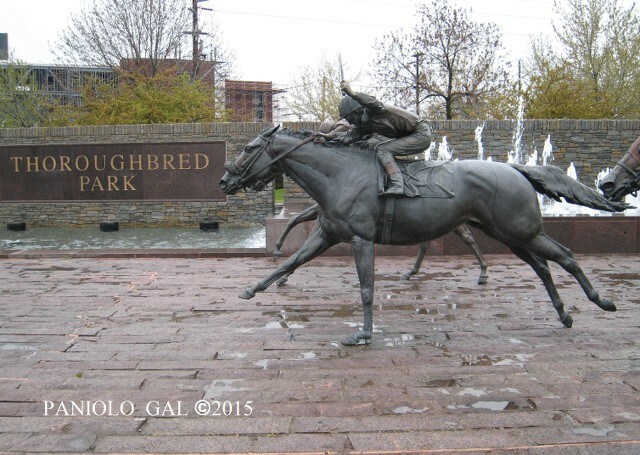 To date, Rutherford has bred or raced over 70 stakes horses. Among this elite group are Cara Rafaela (G1 winner & Kentucky Broodmare of the Year after producing Bernardini) and Candytuft (dam of Midnight Lute). The original Headley land was comprised of 125 acres and Rutherford later added 180 acres on the West side of Rice Road. The 1789 Gray Mansion (not pictured) was used as the background scenes in "Gone With the Wind" and "Kentucky". 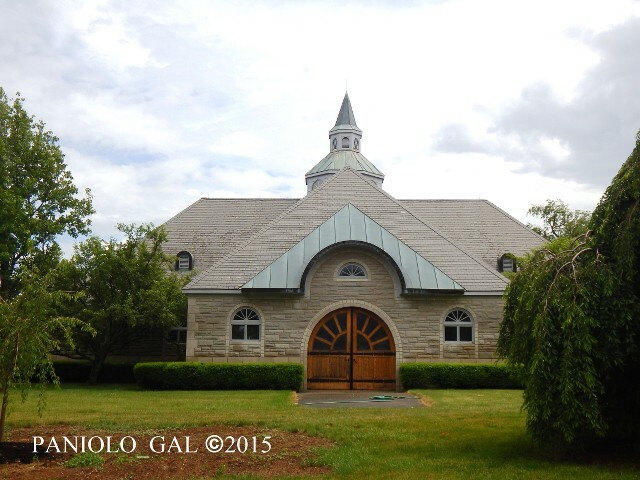 ▲One of the breeding barns at Mancester Farm located on a hill along Rice Road. 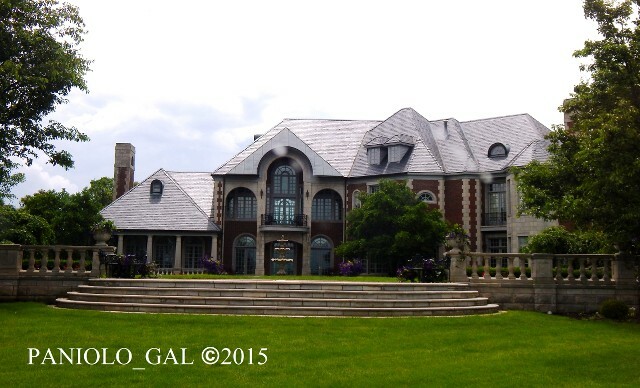 ▲A closer view of the Manchester Farm breeding barn. Horses live in luxury here. 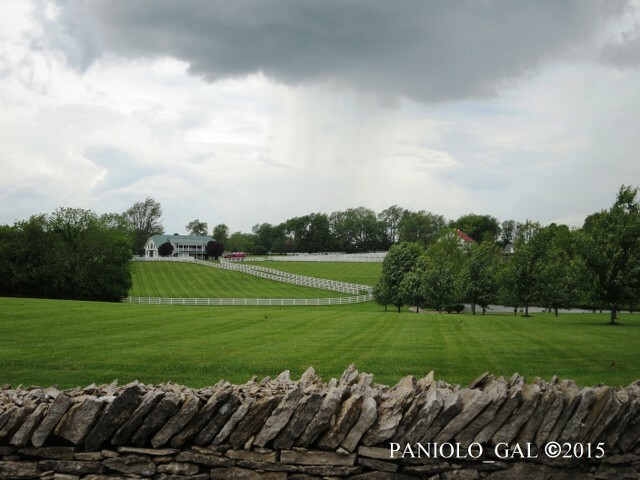 Rose Hill Farm encompasses 375 acres with 7 barns and 100 stalls. This estate is owned by Mr. and Mrs. Tony Ocampo. Tony Ocampo has his background in Animal Science and Equine Management from Louisiana Tech. After working at Prestonwood Farm (1988-1990), he managed Gleneagles Farm in Versailles and eventually bought the business from Ken Baer in 1999 and renamed it Rose Hill. Rose Hill is located just behind Keeneland and near Manchester Farm. 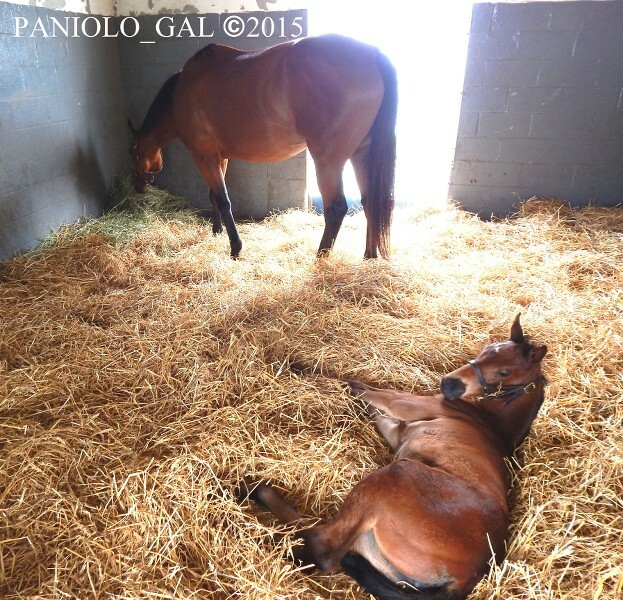 This is another broodmare facility and they currently have 51 mares in their facility. ▲At Rose Hill Farm-"Mama can I greet these people in the van?" "No honey...stay away...no talking to strangers!" ▲It was unfortunate that our tour agenda did not include visiting this "storied" breeding farm. 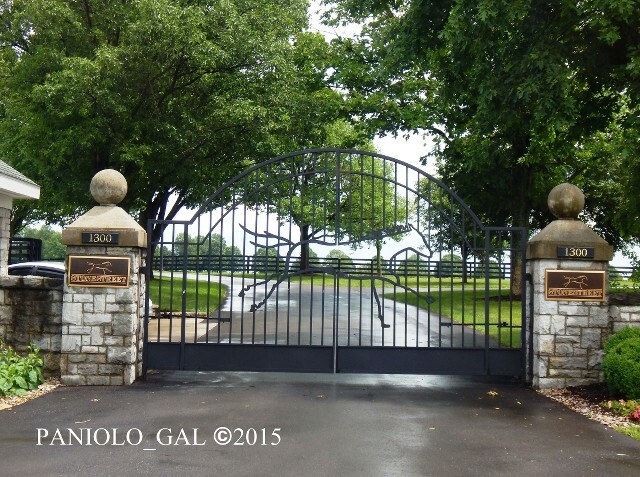 Above: The entrance to Jess Jackson's Stonestreet Farm. As a famed winemaker, Jess knew that a successful Thoroughbred operation has to begin with choice farmland. After purchasing the former Buckram Oak Estate in February 2005, Jackson established Stonestreet's yearling Division. This property is dotted with freshwater springs near the town of Versailles. Another goal for Jackson's fledgling operation, was to own a truly great racehorse. In February 2007, Jackson's Stonestreet Stables purchased a controlling interest ($3.5M in a private sale) in a promising 3-year-old colt named Curlin. The rest is history! Curlin was to become the Eclipse Champion 3-Year Old and HOY in 2007 and Eclipse Champion Older Male & HOY in 2008. Curlin was inducted into the Hall of Fame in 2014. In 2008, Jackson acquired a majority interest in super fillly, Rachel Alexandra. Rachel Alexandra was to become the first 3-year old filly to win the HOY honors and Jackson became the first owner to have won three consecutive HOY awards with two different runners in the Eclipse Era. In a short amount of time, Jess Jackson made an unprecented splash in American Racing. Shortly after hearing Rachel Alexandra was in foal to Curlin (in April 2011), on 4/21/2011, Jackson passed away at the age of 81. He left behind with Stonestreet, a breeding operation for long-term success and a legacy of sportsmanship, integrity and the pursuit of excellence in Thoroughbred Racing. Barbara Banke continues Jess Jackson's legacy as is evident in recent champions Teen Pauline (2010f), and Dreaming of Julia (2010f). Stonestreet Farm is Home of Rachel Alexandra, Maggy Hawk, Kauai Katie, Hot Dixie Chick and My Miss Aurelia among many other stellar broodmares! 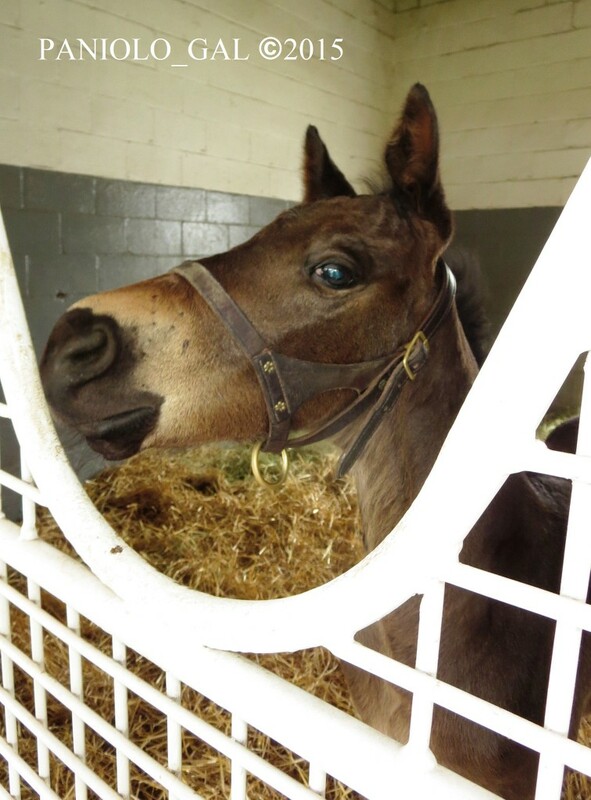 ▲Perhaps part of Stonestreet Farm-A pretty curly-mane foal takes a shy peek at our van parked next to her. Hill 'n Dale Farms was incorporated in Kentucky in 1987. The original Hill 'n Dale was founded in Canada in 1960 by John Sikura Jr., the father of Hill 'n Dale owner and president John G. Sikura. The farm consists of 1300 acres of prime Kentucky bluegrass at the site of the former North Ridge Farm. Hill 'n Dale also exists in Aurora, Ontario, Canada which is run by R. Glenn Sikura. They run an interdependent connection between the two farms. Atreides (2011), Concord Point (2007), Flashback (2010), Maclean's Music (2008), Midnight Lute (2003), Misremembered (2006), New Year's Day (2011), Power Broker (2010), Stormy Atlantic (1994) and Violence (2010). 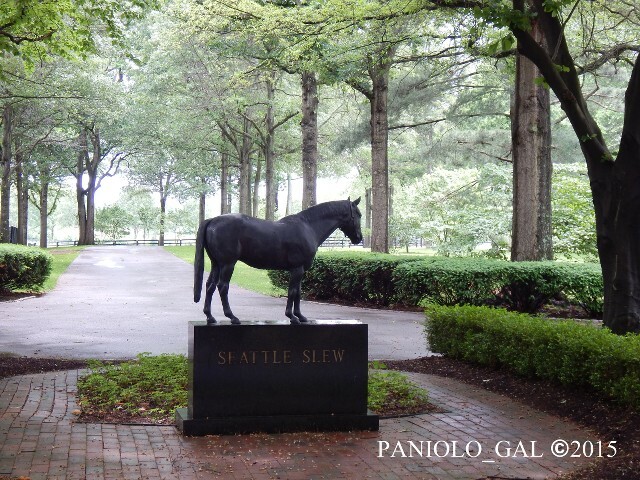 ▲As we drove up the tree covered entrance to Hill 'n Dale Farm, a miniature statue of Seattle Slew looks over his left shoulder toward the driveway to greeted us at the cul-de-sac. Seattle Slew (2/15/1974 - 5/7/2002) stood at Spendthrift Farm in Lexington for 7 years before moving to Three Chimneys Farm in 1985. Before he became too ill, Seattle Slew carried a $300,000 stud fee. But in late February 2002, Seattle Slew suffered from a spinal cord compression between his vertebrae 4 & 5 and 5 & 6, due to arthritic changes in the vertebrae and was removed from stud duty on 2/25/2002. It was his 2nd bout with the condition in his vertebrae where he earlier had to have his vertebrae 6 & 7 fused with surgery in 2000. 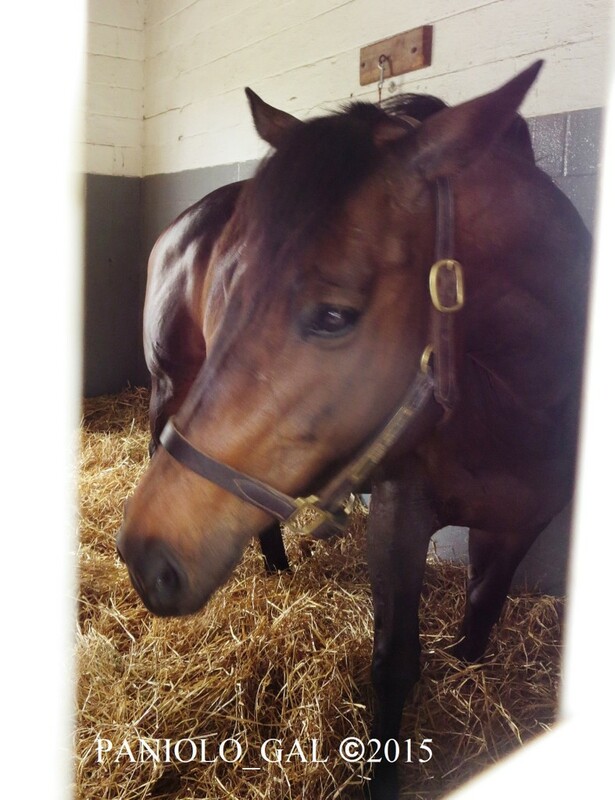 On 4/1/2002, in order to recover from his second spinal surgery and not be agitated with mares in the vicinity, Seattle Slew was moved from Three Chimneys Farm to Hill 'n Dale Farm. The reason stated: "it is in Slew's best interest to be in a setting which allows him to be more isolated from mares coming to the breeding shed...Hill 'n Dale provides that opportunity". Slew's owners, Mickey & Karen Taylor moved to Kentucky from Washington State two years earlier (2000) to be closer to the horse and had slept in the stall with Seattle Slew. Just after midnight on Monday 5/7/2002 Seattle Slew said his goodbyes. He came up to Mike Taylor who had been sleeping in the stall, looked him straight in the eye to say thank you, then sniffed the dog Chet.. They licked tongues and then Slew laid down to go to sleep. 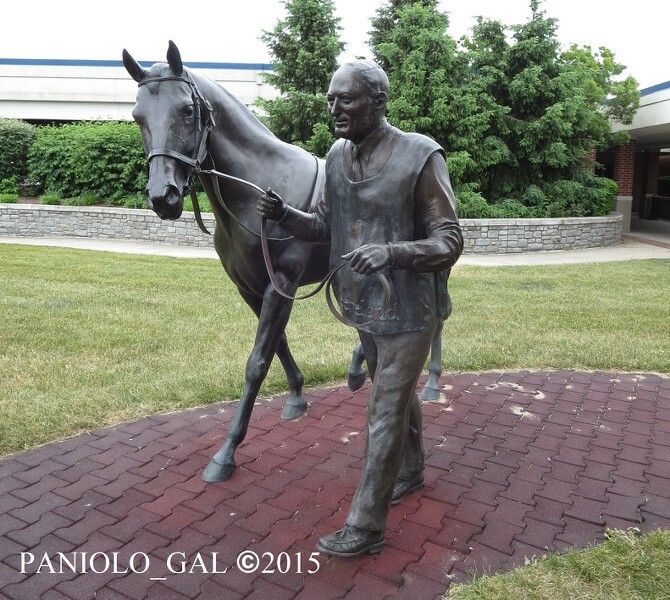 It was 25 years to the day after he won the Kentucky Derby. That night, Seattle Slew died in his sleep at age 28. 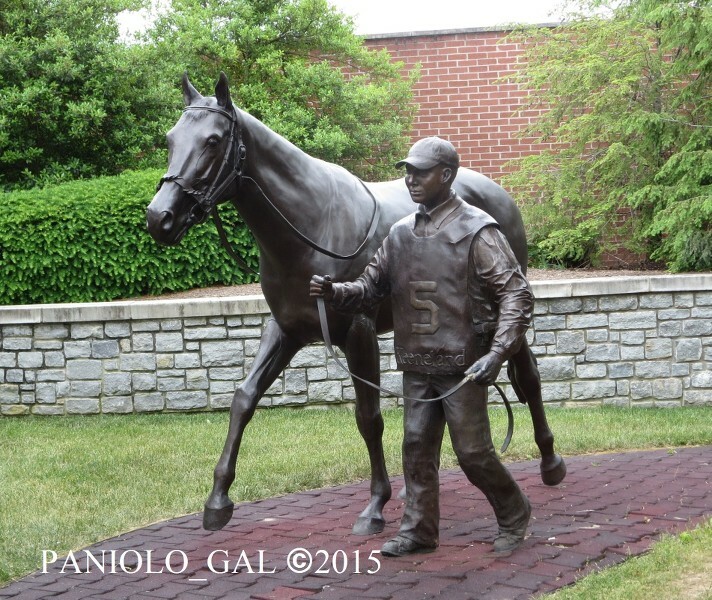 He was buried whole, the highest honor for a winning race horse in the courtyard at Hill 'n Dale farm. He was buried with his favorite blanket and a bag of peppermints which he liked to eat. Since Triple Crown winner and rival Affirmed died the year before on January 12, 2001, at the time, he was the sole living Triple Crown winner. His death left the racing world without a living Triple Crown winner for the first time since Sir Barton first accomplished the feat in 1919! 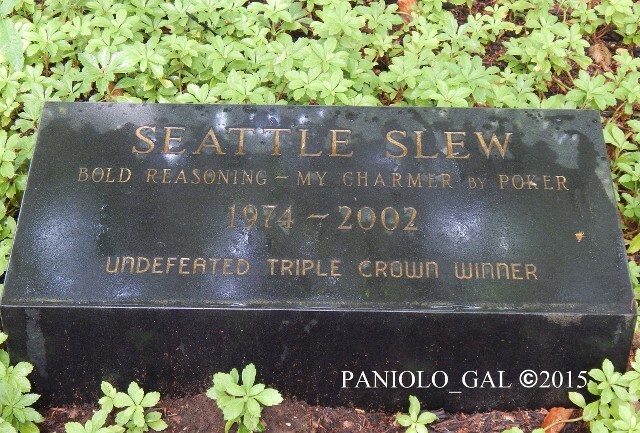 ▲Seattle Slew's gravesite setting. Steps up to the Stallion Barn is on the upper left on the photo. ▲A close-up of the miniature bronze statue of this Magnificent Legend. 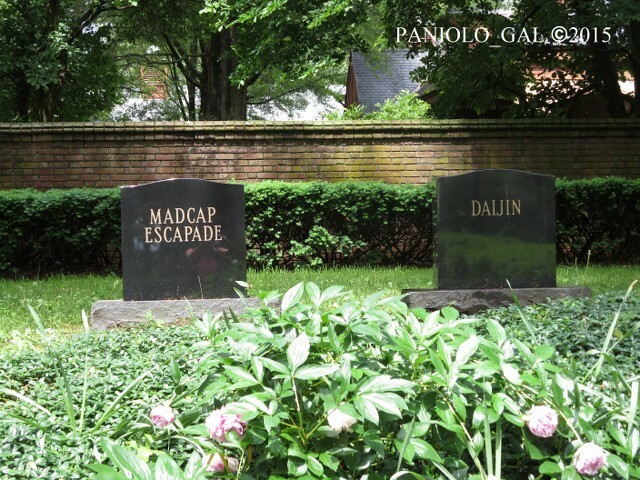 ▲Other headstones of former "Stellar Mares" that stood at Hill 'n Dale-Madcap Escapade (2001f) who died on 6/2/12 of colic, Madcap was the farm's foundation mare & Daijin (1992f) who died on 2/8/2011 while foaling. ▲The headstone of Theatrica-IRE (1982c) who died on 8/31/2012 due to infirmities of old age at 30 years. He stood at stud for Hill 'n Dale from 1988 and was pensioned in 10/13/2009. Theatrical was the Champion Older Horse in Ireland & Champion Turf Male in the USA in 1987. ▲The Stallion Barn and courtyard. Seattle Slew's stall is the first stall on the left wing just off the photo closest to the camera. ▲The left stall was Seattle Slew's stall. 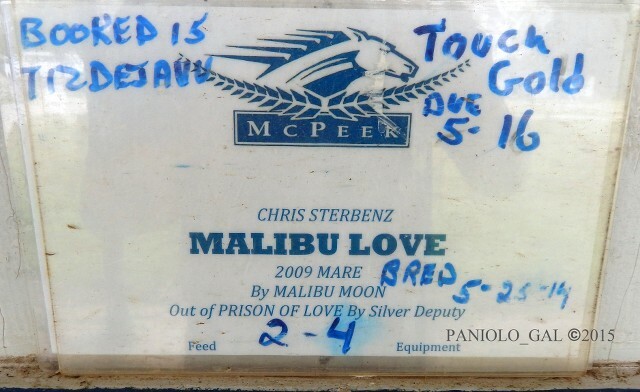 ▲A blurred close-up of Seattle Slew's stall. 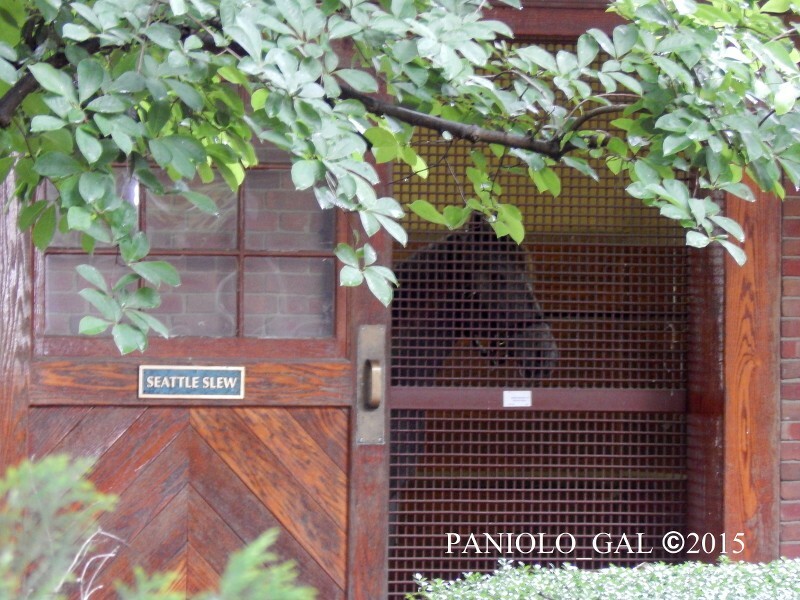 The stallion currently in the stall appears to be a grey, it might be either Concord Point (2007) or Flashback (2010). 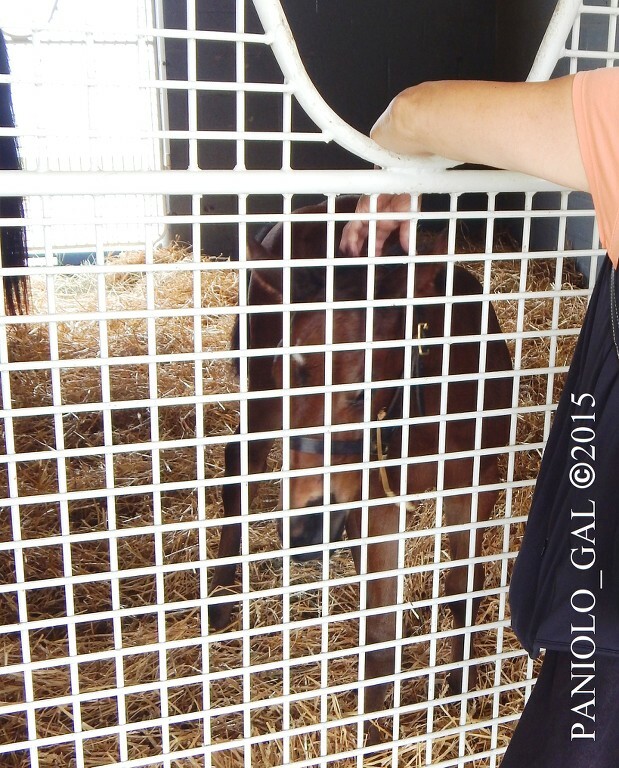 UP NEXT...DONAMIRE FARM AND PLAYING WITH THE FOALS AT MAGDELENA FARM! 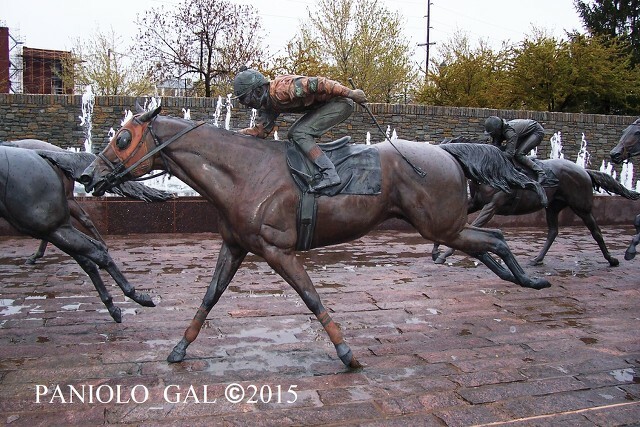 Just a quick comment on sculptor Gwen Reardon; Marylou Whitney is donating Saratoga Centennial Park and a Gwen Reardon Native Dancer Bronze......Except the sculpture isn't ready yet, so they borrowed a Storm Cat bronze from friends in Lexington until August 1st, when native Dancer is supposed to be ready! Thank you for sharing your trip! I know I've been driving by these places many times but have not had a chance to do any farms tours - yet. This is a great place to start, right here in the comfort of my own home with your pictures. 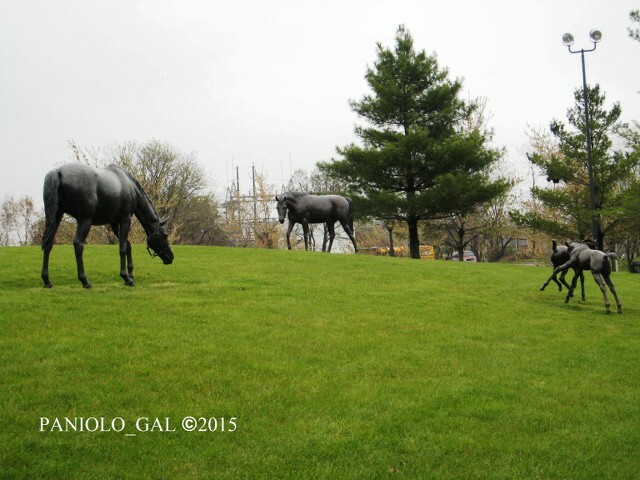 I do love all those sculptures at The Thoroughbred Park - such a serene setting in the middle of downtown. Lovely. @SallyT: Thanks for the great update on Gwen Reardon! We'd love to later see the finished Native Dancer Statue! @Celeste_in_TX I hope you get a chance to take a tour of the farms on your next visit...I'd love to see your story/photos in this discussion as well. @bigherbie After I finished this tour, you now have a "home" to place your photos from your 2010 trip too! Anxious to see photos from Three Chimneys, Lane's End, etc.! More info/photos coming...soon! 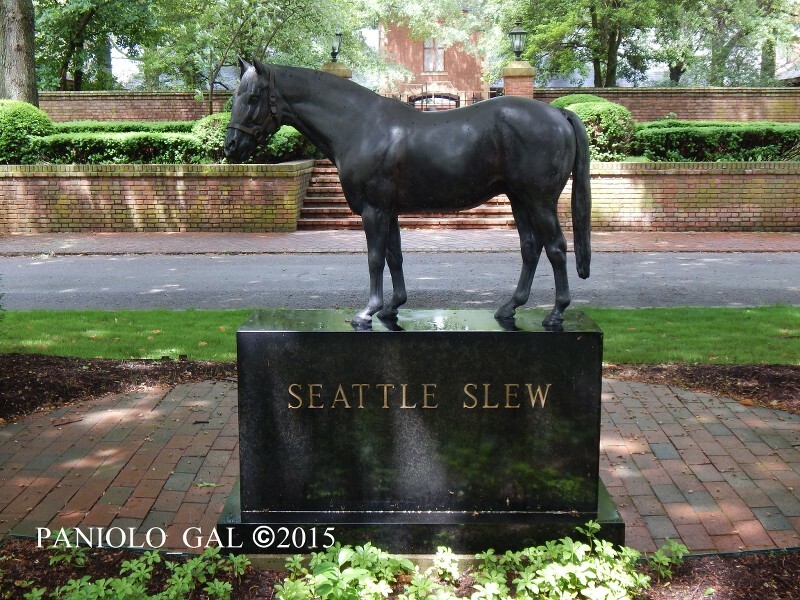 btw...I hope you got a chance to read about Seattle Slew in the review on Hill 'n Dale. Especially "The Night Seattle Slew Said Goodbye Forever". I thought it was very touching...brought out the Kleenex when I discovered this story. NEXT STOP IN OUR TOUR...DONAMIRE FARM! ▲As we toured around Fayette County, you could see that a thunder storm was slowly approaching the area. ▲A typical sight as we toured around the Fayette region. Note the old stone fences in the foreground. These were first introduced by Scottish & Irish masons in the 18th and 19th century and later built by slaves. The slaves became so proficient in creating these stone fences, they were also referred to as "slave walls". Many are still in excellent condition for their age. Efforts are currently being made to preserve these historic structures from the past. Donamire Farm is located on the corner of Old Frankfort Pike and Yarnallton Road. It is a 620 acre farm owned by Don and Mira Ball, who own one of Lexington's top home-building companies, Ball Homes. Their racing operation has been a family affair with son, Mike who trained their homebred racers before joining his parents and siblings at Ball Homes. Mike's wife Katherine now trains the Donamire horses. Donald and Mira Ball bought the farm in 1983 and combined their first names to create Donamire Farm. They are one of the few breeding farm owners that live at their residence year round. This farm has all the trappings of a first-class Thoroughbred racing and breeding operation. It also has a 5-furlong training track along with a 1-mile grass course replicating European turf courses with rolling hills to strengthen the horses during training. Donamire is currently a broodmare farm and there are no stallions currently standing at stud there. 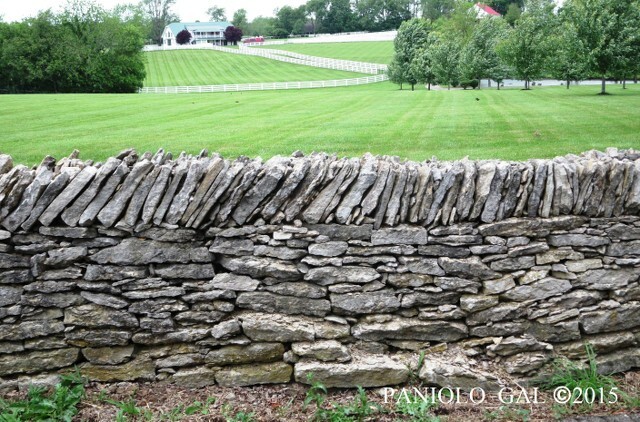 Besides 15 miles of white fencing, they have preserved stone fences that date from 1820. Above: The centerpiece of the Donamire Farm is the main residence, modeled after a French chateau designed by Architect Thomas E. Lett, which sits on the highest point of the farm. The guest house, Barkham Hall, is built like an English manor house. It has 10,000 square feet, two elegant guest suites, 30-foot-tall gray Doric columns and a brick chimney. Donamire also has its own conservatory, rose garden and greenhouse, as well as a five-acre vineyard that was planted in 1999." Several racing movies have been filmed at Donamire including Dreamer (starring Dakota Fanning), Simpatico and Secretariat. 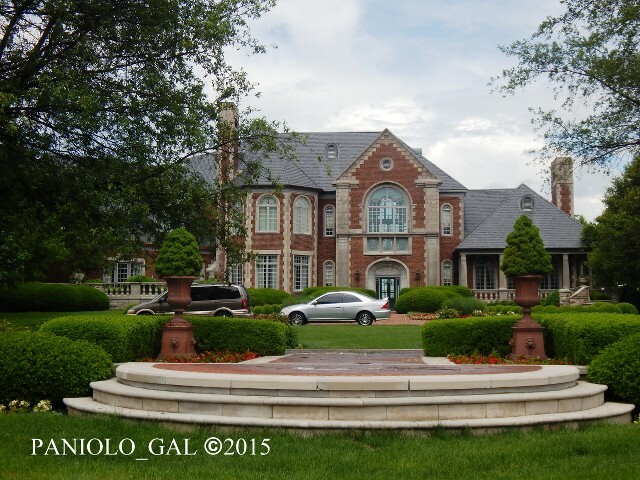 Donamire is famed in Lexington as a location for fund-raising parties held for various charities at no charge-it is the Ball family's donation to the cause. Don and Mira Ball's charitable philosophy has earned them the Chutzpah Award in 2010. 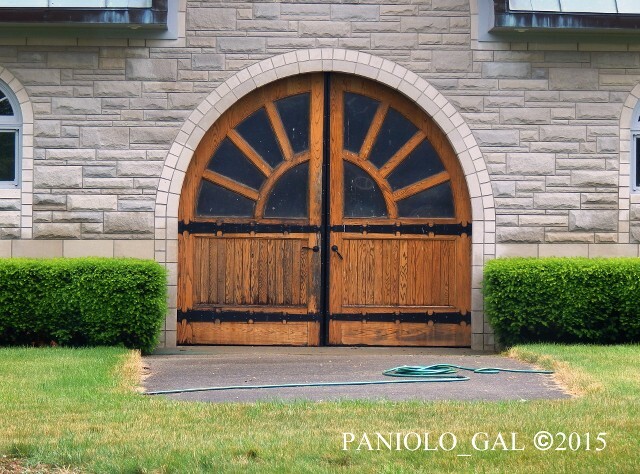 ▲With money to spare, we were informed that these doors to one of the barns had cost the owners $25,000! ▲A Close-Up of these $25,000 barn doors...they currently need a little refinishing work in my opinion. ▲A blurry photo from the moving tour van...Foals playing in the paddocks at Donamire Farm! ▲Another blurry photo taken from the tour van at Donamire...It's lunch time! NEXT UP...PLAYING WITH THE FOALS AT MAGDELENA! PLAYING WITH THE FOALS AT MAGDELENA FARM! 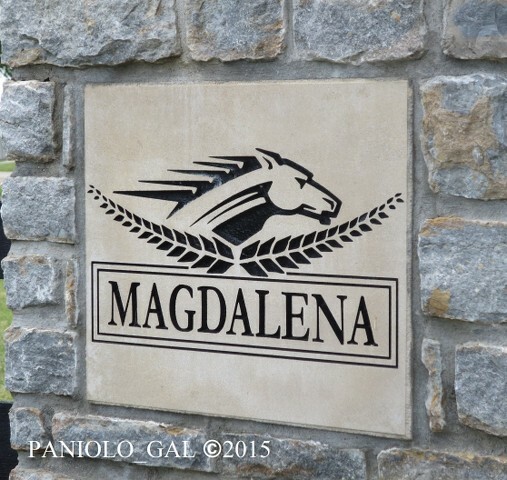 Magdelena Farm, part of McPeek Racing consists of 5 barns and over 60 stalls. The farm facilities enable housing of horses at various stages of their careers from breaking, racing, layup, rehabilitation sales prep and/or breeding and foaling. The farm consists of a 115 acre farm with fenced pastures and paddocks of various sizes. They have a turf course along the perimeter of the farm that is 1-1/2 miles long and 100 feet wide with inclines designed to strengthen the horses heart, lungs and muscles. Kenny McPeek has a special interest in South American bloodstock and has found clients successful racers like Tejano run, Take Charge Lady, Repent, Sarava, Noble's Promise and Kathmanblu among others. We got an opportunity to play with this year's foals at Magdelena Farm. Kenny believes that early human contact makes for a more confident and less fearful horse. McPeek believes this regular contact with strangers enables easier handling during the training stages of the thoroughbreds. However, on this day, there was a thunderstorm brewing in the air and the staff brought all the mares and their foals inside. 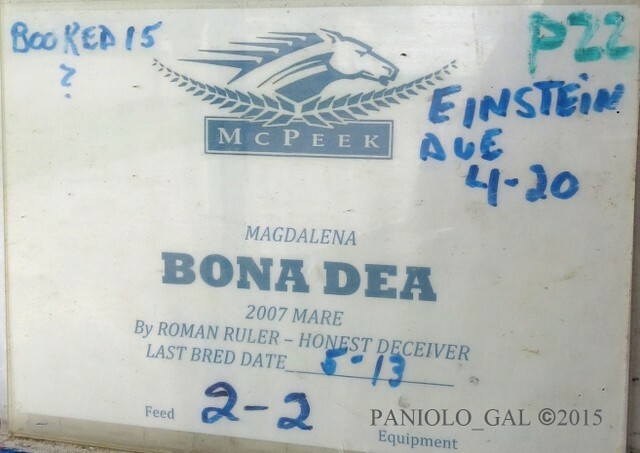 We were slightly disappointed that we didn't get to take better photos outside, but this allowed us to know who sired the foals with the nameplates on the stall wall. Regardless, we had fun "talking" to both mares and their foals and were allowed the opportunity to love on these cute babies. We eagerly gave them back scratches, massages and lots of pets on their soft muzzles and fuzzy foal coats! I could have stayed here for hours, but we were on a timetable with the tour. ▲Don't you think I'm good looking? ▲How do you like my ears? ▲More posing for the camera. ▲ Can you massage my gums on the otherside too? ▲ Just wait, in a few years...I will be a Champion! ▲Pretty mama Bona Dea looks on in-between her afternoon meal. ▲Oh! We have visitors! I guess I better wake up. ▲Let me have my afternoon snack first. ▲Mmmmm! Mama's milk is just yummy! ▲Well...Here I am. Can someone scratch my head? ▲Ooooh! That feels good! How about my neck...Ooooh! Let me move closer so you can massage my back as well! 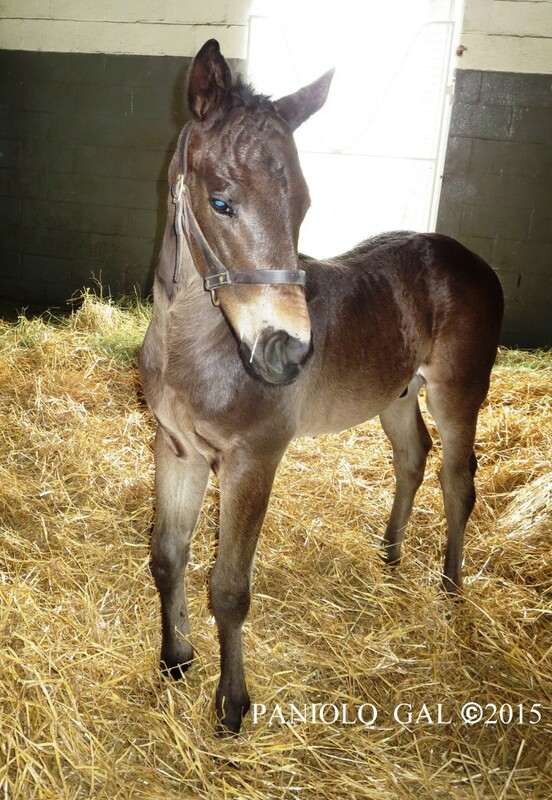 Malibu Love's foal was soo darn cute! She or he lowered it's head to let us scratch the forelock...then moved over a bit closer for better access to its mane...then maneuvered its body closer so that its back and hindquarters could get a good topline massage as well! This morning I am overwhelmed with your tour, Paniolo_Gal, as some of your photos and commentary strikes me on several levels - I don't know if I can even comment coherently or not - lol. 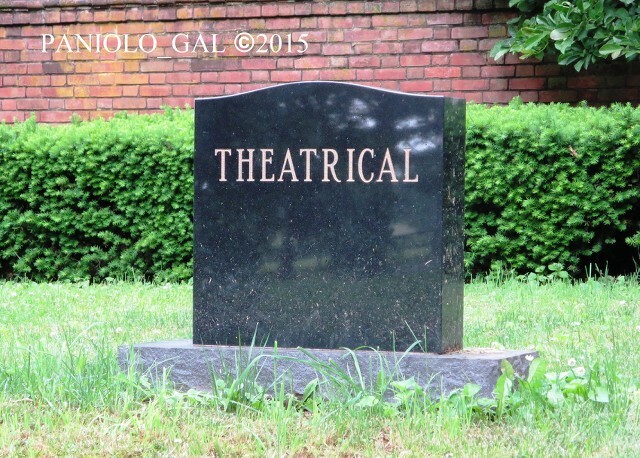 First - the photo of the gravesite of Theatrical - wow. He is the broodmare sire of my OTTB, Sugarfoot. 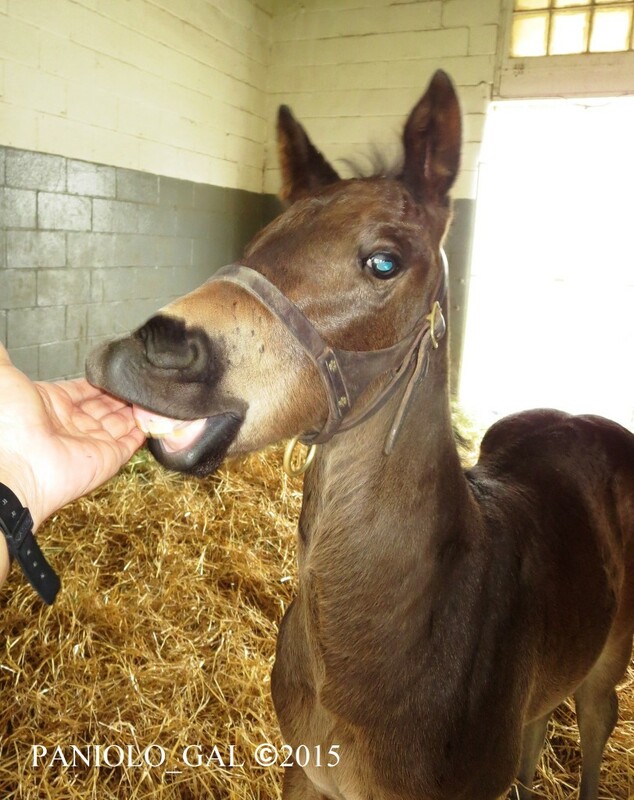 Second - all the photos of McPeek's operations and how they let you handle the foals, his philosophy. My sweet OTTB was with Kenny McPeek for his first five starts, and he is such a good, sweet natured horse I've always felt like he got a good start somewhere, so maybe it was here. I've tried doing research but have not been able to come up with much so I'm going to let my imagination play around with this a bit and enjoy your photos and your trip and just be grateful that if he was raised here, he did get a good start in his life. I am just so amazed they let you get so close up with the foals and to be able to really enjoy them and it just stands to reason that it is going to give them more confidence when they grow up and they've been around many people. What a concept! Can't wait for the next installment of your trip!